What is your ethnicity/race? Did your family have any customs related to food? I am Hong Kong-Chinese Canadian. Like many other cultures, Chinese holidays and celebrations are often centred around food. I feel very lucky that growing up, we ate dinner together as a family most nights, and would have dinner or dim sum with extended family almost every week. Not being wasteful is an overarching message that we got about eating - even now there is a "clean your plate" attitude at the dinner table. I did my Bachelor of Science in Nutritional Sciences at McGill University, which has an integrated internship program. I graduated in 2009. What do you do now as an RDN and what does a typical day look like for you? I work part-time for the local health authority in outpatient chronic disease management and GI. I also have a private practice where I specialize in working with people struggling with chronic dieting and/or disordered eating using an intuitive eating and Health At Every Size® lens. A typical week would include a couple days at my job, where I see clients one-on-one and I also teach group classes on a variety of topics (using pre-written slides that I sometimes *ahem* "interpret creatively") about twice a month, and a couple days in my private practice. In my private practice I usually dedicate one day a week where I am working from home, writing my newsletter/blog, doing some contract work and admin stuff. On the other days I meet with clients in-person and online, and frequently meet with other professionals to collaborate, coordinate care, and receive supervision to continue to grow as a professional. My husband and I hosted both our families for Mother's Day at our house this year. Growing up, I was always skilled in math and sciences, and within my family there was always some pressure to take over the family business, or to become a professional. I never wanted to be a doctor because I always felt that doctors are expected to know everything. That seemed too stressful for me. We had a family friend who was a dietitian, which introduced me to this career path. I chose the career because I was fascinated by the idea of learning how different nutrients found in food acted in our bodies, Learning more about the various aspects of nutrition and dietetics in university and in my career is what has kept me interested [in this field]. There isn't really one challenge that sticks out for me in particular, but what I've found is that university and internship can only prepare you so much for a career in dietetics. There is so much learning that is done on the job, and so much that I still don't know. I wish that we had more space to *not* be the expert. Have you had any mentors in your career? If yes how have those mentors affected your career/life? One of my first mentors was Lindy Kennedy, who helped me navigate my first job as the founding dietitian in a private primary care clinic. She also helped me recognize my skills in media work. He doesn't know it, but I consider my friend Dan Clapson to be a mentor. He taught me that you don't have to be serious to be taken seriously, and it's because of him that I crave the flexibility of working in private practice. More recently, I've been grateful to find the HAES community, where I'd like to think I have many mentors. Since discovering HAES, I definitely feel like I have a clearer vision of how I want to practice dietetics. 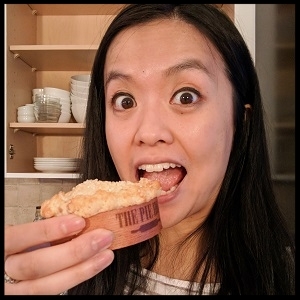 Pi Day 2018: This year's Pi Day and Dietitians Day fell on the same day, so naturally I had to celebrate! As a Chinese/Asian person, I do see that there are many Chinese/Asian people in the field. However I don't feel that our knowledge base meets the needs of an increasingly diverse field and client population. The vast majority of subjects for nutrition studies are white, cis-gendered people. "Culturally aware" resources really just list token "cultural foods" and dishes, but tend to ignore the way that these foods are eaten. For example, soy milk was not invented to be a "milk substitute", but is promoted as such. MyPlate doesn't take into account that many Asian cultures serve meals family-style. I recently attended a talk by Alan Aragon who noted that while science itself is a "perfect system", research, as a vehicle for science, is driven by humans, and can thus be coloured by errors and biases. Thus, while evidence-based practice is important, I think there is only so much we can know from the evidence, especially since our current evidence-base is driven by mostly white, male, cis-gender researchers living in patriarchal and capitalist systems, and we need to recognize other ways of knowing. I believe that our diverse life experiences are what add richness to our work. I helped found a local dietitian meetup group here in Calgary.I am grateful to be a part of a profession of so many inspiring women. But as you can see - much more diversity still needed! My younger self was definitely more of a perfectionist, and worried about marks [a.k.a. grades for our American readers] and "doing it right”. So I never even thought to question what I was being taught. It's only now that I'm older and have more experience in my career and in life, that I see all the nuances and things to "unlearn". So my piece of advice would be, take things with a grain of salt and trust your intuition. I know it's scary to question things, or make noise, especially when you feel like your grades, degree or career is on the line, but really, the only way our profession can grow is to question and approach situations with curiosity and open-mindedness. Vincci is a non-diet Dietitian, Certified Intuitive Eating Counselor and Health at Every Size advocate. She was born in Hong Kong and raise in Calgary, Canada, where she still lives and works. Vincci was born in Hong. You can learn more about Vincci and her work on her website or by following her on Instagram or Facebook.